The "go-to" machine for professionals and military personnel around the world, Panasonic gives the highest priority to creating products our customers can trust. While the different models may have been created with a specific user community or industry in mind, each can be counted on to deliver innovation, reliability and performance. Panasonic's ruggedized technologies can withstand brutal conditions and are on the job every day in police, EMT and fire vehicles not to mention scores of professional fleet vehicles. If you need a computer that can take drop, shock, vibration, rain, dust, sand, altitude, freeze/ thaw, high/low temperature, temperature shock, humidity, explosive atmospheres, look no more. 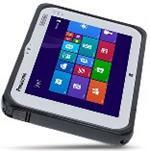 20 years of technology innovation have created a Toughbook for every use, every industry and every market segment. If you need a discountinued model, call us. We have some of them still in stock. 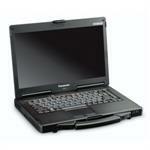 Panasonic Toughbook CF-53 mk4 - Great Deal - In Stock Inventory - Hurry! The Panasonic CF 53 can be customized with your specific configuration with a great price. Let us help build one for you.